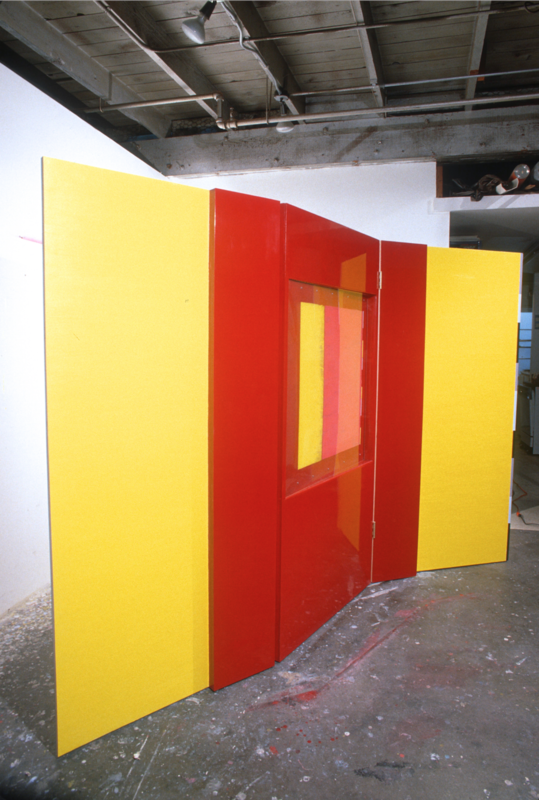 Frank Gehry asked me to make a screen that would block a window in his house from someone looking in from outside. I made a screen where from one side, in front of where the window was, one looked into a frame at a gouache. This is what one would look at from inside the room. On the other one saw, from outside the house, mostly a plywood section, with a small blue square and shallow relief that mirrored the gouache’s location on its other side, flanked by two Plexiglas versions of a night sky color which would stretch beyond the window into which someone might look. So what you saw from outside was plywood flanked by dark blue like the sky above, if you looked in at night. Frank found the screen too cumbersome or something and keeps it in storage.